Two Women. Two Eras. One painting that ties them together. July 1967, Mayfair, London--a painting is left propped on the doorstep of the Skeleton Gallery, discovered by Odelle Bastien, a Caribbean émigré trying to make her way in London. The painting is rumored to be the work of Isaac Robles, whose mysterious death has confounded the art world for decades. The excitement over the painting is only matched by the tension around the conflicting stories of its discovery. Odelle is unsure who or what to believe as she is drawn into a complex web of secrets and deceptions. Thirty years earlier, Olive Schloss, the daughter of a Viennese Jewish art dealer, follows her parents to a village in southern Spain that is rife with unrest. It is here Olive meets María Teresita, the young housekeeper, and María’s half-brother Isaac Robles, an ambitious painter newly returned from the Barcelona salons. The illegitimate offspring of the local landowner, neither sibling has anything to lose when by exploiting these new guests in their poverty-stricken town. As they insinuate themselves into the family, the consequences are devastating and echo into the decades to come. “[A] smart blend of literary and commercial fiction with intriguing characters and a compelling mystery at its center... Burton creatively infuses historical fiction with mystery in her exploration of the far-reaching consequences of deception, the relationship between art and artist, and the complex trajectory of women’s desires. 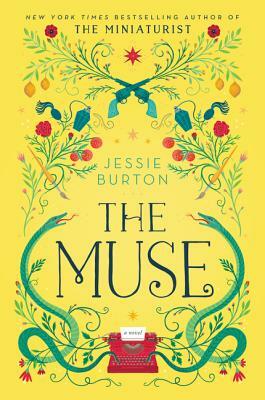 The Muse is a brilliantly realised story, and the parallel narratives are perfectly balanced, propelling the story forward at break-neck speed... Jessie Burton can expect more awards to soon be coming her way.